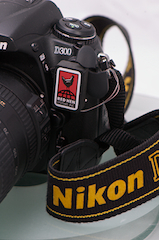 Last year Nikon announced the latest in their range of Digital SLR cameras, the D3 and D300. 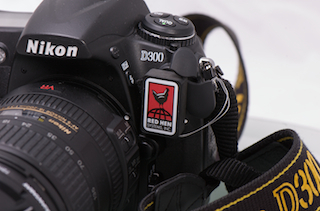 These are targeted at the top of the range with a price tag of £3400 for the D3 (yes that is three thousand) and a slightly more affordable £1300 for the D300. 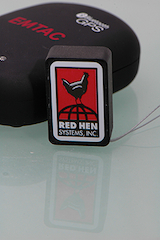 Red Hen Systems have produced a tiny Bluetooth adapter that connects to a bluetooth GPS and transmits the GPS data to the camera: the Blue2CAN. The Blue2CAN retails at $279 USD. 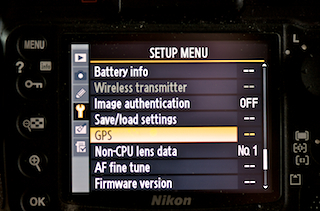 Both new Nikon cameras have a special 10 pin connector which amongst other functions allows you to connect a GPS to the camera. This then provides a NMEA datastream from which the camera can extract the positional information and stamp the image meta data with the location that the picture was taken. If all that sounds a bit daunting don't worry I will explain it a briefly below. When you take a picture with a camera a number of attributes are stored with the picture. You can consider this as 2 files of data one of which is the image itself and the other is a series of attributes which describe a number of things about the image. You will be used to seeing some of these such as the file name and the file date, some of you may also be aware of the File Created date. There is a defined specification for these attributes known as EXIF. These additional attributes describe all sorts of technical information such as the camera make and model, the exposure settings etc. Amongst these data is a definition for GPS Latitude and Longitude. Of course there are very few cameras that can automatically insert this information into the metadata, but they are becoming more prevalent. 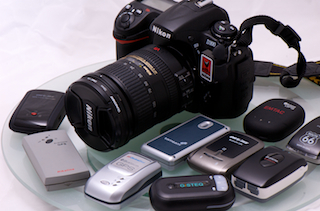 In particular the new Nokia phones with embedded GPS place the position into the files, and of course the Nikon D3 and D300 have the capability with added hardware to do so as well. In the last year I have reviewed a number of GPS systems that offer a mechanism to match GPS tracks to digital photos. Whilst these do work they add an additional step into the workflow and the possibility of errors creep in with each additional step. The beauty of this system is to have the camera stamp the image when the shutter is pressed. OK so now we know what it is, but what use is putting this data in the file? Well I know a lot of photographers who always like to know the exposure settings of each picture, this system just takes it one step further and lets you know exactly where you took the picture. But the position is meaningless unless you can do something with it... Fortunately the likes of Google, Locr, Flikr and many others allow you to create Geo-referenced image libraries. This allows you to display your pictures in Google Earth or on Google Maps. This really takes the photo album to the next level!!! The Blue2CAN is a surprisingly small and compact accessory for the high end Nikon Cameras that establishes a connection to a Bluetooth GPS and then transmits the GPS position data to the camera's processor. Measuring just over an inch by 3/4 inch and about 3/8 inch thick it is quite unobtrusive when attached to the camera. There is a short, thin lanyard that connects to the camera strap "D" ring which prevents the Blue2CAN getting lost if knocked out of the socket. Trust me this is an essential design feature, I have caught it a few times in my camera bag. The Nikon Cameras have a propriety 10 pin interface to external devices. 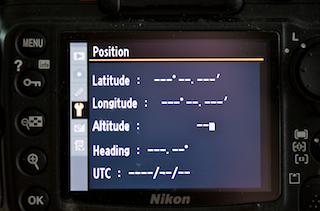 This is located on the left hand side of the Nikon D300 just under the flash sync socket. For the Blue2CAN to fit properly I found that I had to remove both the Nikon Accessory and the sync dust caps. The bluetooth adapter then just clicks into place once the pins have been lined up correctly. My first impression was that the fit was so good that it would really take some prying to remove it, but I subsequently found that some clumsy handling could catch and dislodge it. I had, foolishly, not attached the lanyard, but fortunately it fell into my bag. As can be seen from the pictures to the right the Red Hen Blue2CAN is tiny, barely bigger than my thumbnail. The Emtac S3 is a small Bluetooth GPS receiver and it towers over the Blue2CAN. On the rear of the bluetooth adapter you can see the 10 pin connector, and if you look very closely about 1/4 of the way down on the right hand side you can just about make out a red LED indicator. 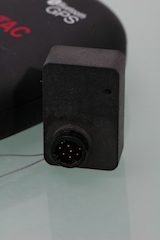 This shows the status of the adapter. 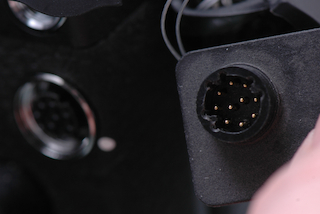 Whilst on the subject of the connector this system is only compatible with the higher end of the Nikon camera range: D200, D2X, D2Xs, D2Hs, D3 and D300. To get started the Blue2CAN and your Bluetooth GPS need to connect to each other. Technically this is known as pairing. The Blue2CAN should be attached when the camera is switched off. As soon as you switch on the adapter's LED will flash 3 times within a second and will then start looking for GPS devices. If it doesn't find a Bluetooth GPS then it will go to sleep for 20 seconds and then search again. This will continue until it manages to pair with a GPS. There is little feedback during this process and it can be a little disconcerting whilst waiting for it to happen. 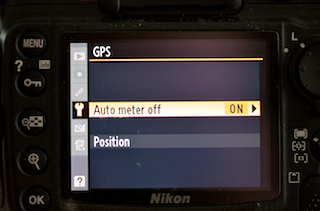 Once paired you need to tell the camera to record the GPS position with the image. This is achieved by pressing the menu button, selecting GPS, then "Auto meter" then select "enable". I was amazed how simple Red Hen had made this process. The main issue with Bluetooth devices is getting them paired, for some reason it is either simple or very complex. As with all GPS applications you cannot do anything without getting a "Fix". this means that the GPS has a clear view of the open sky and has locked on to the satellites orbiting the Earth. You don't need to worry too much about the technicalities of this other than it may take up to 3 minutes to get a fix. All the Bluetooth GPS devices I have seen have a flashing indicator showing the status. 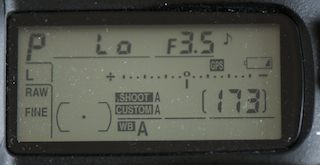 To check if the position is being transmitted to your camera correctly you will see a position option on the GPS menu. If you select this you will see the GPS data. The screen to the right shows what happens when you use the GPS indoors... The GPS connects but no position is recorded. As soon as the GPS reports co-ordinates this screen is updated. When you have the camera on and the shutter button half down along with the normal camera info you will see a small GPS indicator. If it is solid then the GPS has a position fix. If it is flashing then the GPS is connected via Bluetooth, but not fixed. If the GPS indicator is not shown then the Blue2CAN is searching for a Bluetooth GPS receiver in range. The effective range of Bluetooth is 30 feet, but I tend to keep the GPS receiver on my camera bag less than 5 feet away. One of the concerns with Bluetooth is compatibility. In practice though there are a number of different versions the standards are well defined. The only problem you may encounter would be if the GPS insisted on having a passcode as the Blue2CAN cannot provide one. I am fortunate enough to have over 20 different Bluetooth GPS receivers and in my tests only 3 failed to connect to the Blue2CAN. These were a Globalsat BT-359, a B-Speech GPS 20C and Evermore BT GPS receivers. I suspect that this is because they need a passcode to pair. One of the interesting features of this system is that the Blue2CAN is not fussy about which (or whose) BT GPS it connects to. I found this out whilst at CeBIT in Hannover in the middle of a technology exhibition I found that my camera was connecting to GPS devices in the exhibition halls. I had not bothered to take mine with me that day. Although that was quite amusing it does raise a slight issue if a group of photographers go out equipped with BT GPS receivers the Blue2CAN is not fussy which GPS it connects to, it will grab the first available, which may not be yours... This is not a problem as if it grabs someone else's they must be within 10 metres which is the accuracy of GPS anyway. If they move out of range then the Blue2CAN will search for and connect to another Bluetooth GPS receiver. Another interesting feature is that even if the camera is switched off the Blue2CAN will still remain active and paired to the Bluetooth GPS receiver. This enables it to instantly have the connection when the camera is switched on, a great idea! Unless of course you use the GPS with a phone or a PDA. The GPS can only connect to one device at a time. It took me a while to work out what had gone wrong with my PDA navigation, with my camera in the boot of the car the GPS was still connected so my PDA couldn't get a connection. I overcame this by luck by switching the GPS off and on again. Although the Blue2CAN is constantly powered whilst connected I found there was more than enough power in a charge to take hundreds of pictures over a 3 day period (some including the built in flash) and still have about 30% left in the battery. 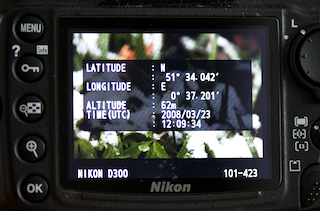 With the Nikon D300 the image review has an additional screen option to show the GPS data. This is accessed in the same way as the image data/histogram. This position data is then saved with the image for use when processing the file either for personal use or public information. Half the fun of photography is taking the pictures, the other half is presenting and showing them. Now if you are talking about commercial applications you may still have fun taking the pictures, but the post production and presentation is most important. In this area we are talking about "tweaking" an average image to improve it, scaling and cropping etc. Traditionally this will be an application like PhotoShop, but may now be a dedicated Photographer's Application such as Apple's Aperture. The thing to be careful with all of these post production applications is to ensure that the EXIF metadata is retained throughout the workflow process. I use a mixture of Aperture and Photoshop CS to process my images depending on what I am trying to achieve. I have found that certain operations in Photoshop save for devices destroys the metadata. My current preferences are to use Aperture on my Mac, and present the processed images in Picasa. Picasa is one of the "GPS aware" online photograph albums that utilise the meta-data stored in an image file to make the presentation of your images with location maps a simple part of the workflow. Ubermind produce a plugin for Aperture that allows the entire workflow for imaging to be executed in one application. 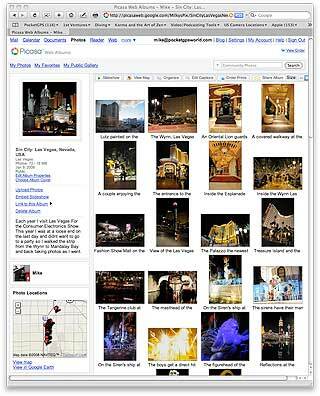 Click here for a sample of images taken in Las Vegas USA using the Blue2CAN and Picasa. Google has revolutionised mapping with Google Earth and Google Maps. We covered Google Keyhole way back in 2004 before it changed its name to Google Earth. Now Google Maps are ubiquitous across most online mapping applications, for an amazing number of devices. The Google mapping is now utilised in a lot of professional and internal applications. The inclusion of geo-referenced images is just another logical step in this evolution. 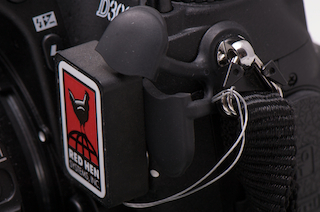 The Red Hen Systems Blue2CAN is a Bluetooth adapter for the high end Nikon digital cameras allowing the connection of a Bluetooth GPS receiver. The compatibility of the adapter was impressive, working seamlessly with a huge range of Bluetooth GPS receivers. The installation and setup is simple and required no technical knowledge. If you are capable of operating one of these Nikon cameras then you are well over-qualified to set up the GPS for the camera. In use the system was subject to the normal limitations of GPS (view of sky to get fix), and has some potentially interesting (but not fatal) side effects when in groups with other Bluetooth GPS users. Probably the best thing about the Red Hen system is the fact that you really don't need to be a techy to use it. It really is that simple... Just remember to charge the battery!!! At $279 it is a bit pricey and about 4 times the cost of a matching GPS device. Having said that for a robust professional device that does not have the economy of large scale production I would not consider it overpriced, especially when the Nikon D3 is retailing at $5000. Have any comments about this article ? Post them here.